My sister-in-law very kindly got me almost every book on my Christmas wishlist last year (I was only expecting 1 book) and I am still getting through the lot. One of the ones I had asked for was the Art of War by Sun Tzu. I figured I should be reconnecting with my heritage and some wisdom wouldn't be wasted. What came as a surprise was the translator's references and comparisons to Confucius's work. Both works are completely different, yet are the deepest influences and perhaps the best reflections of the Chinese culture and psyche - even after so many centuries. ...is it possible to make the connections? From what I know of Confucious -- none of what remains is actually his works; they are books written about his work many years after Confucious died. ...but then again, people still question if Sun Tzu ever actually existed as well. Confucious and Sun Tzu, though different in life (if you believe the tales), did ultimately have the same goals - the betterment of the human condition. 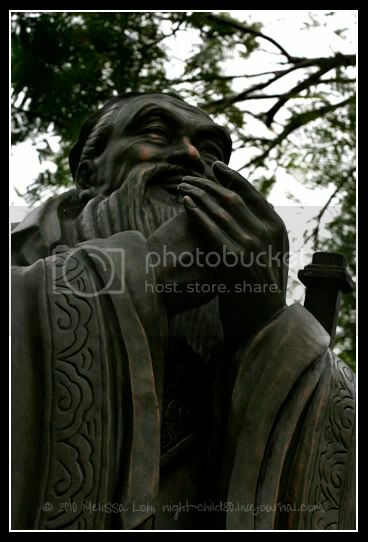 Confucious, to live a good life through a code of conduct for public and personal life. And Sun Tze, to live a good life through proverbial wisdom. Their validity is possibly no different than Christ. The New Testament wasn't written by him, but by followers dating 30 years after his death. As with much of history, one would do well to take it with a big pinch of salt. We as a people are renowned for spinning the wildest tales from the tiniest of whispers. Sinbad, King Arthur, Cleopatra... we all take for granted that they existed without questioning how much of the tales told about them are true.